Libraries play an important role in the college experience. In addition to the academic resources they offer, libraries also figure prominently in campus life as venues for study group meetings, random run-ins with friends, and the location for late-night cramming sessions and furious efforts to finish term papers on time. While a growing number of student resources have migrated to remotely accessible digital formats, campus libraries continue to facilitate learning while strengthening social bonds. In the past, libraries wielded a great deal of influence on a college's ability to attract top students and scholars. While the digital availability of library materials has done much to level this playing field, libraries continue to be a major source of prestige for colleges and universities that boast expansive and elite resource collections. College libraries also contribute to the on-campus atmosphere, and knowledgeable librarians can help students improve their academic performance by guiding users to information and resources they might not otherwise locate on their own. Harvard University is one of the world's most famous institutes of higher learning, enjoying a peerless reputation in terms of its scholastic excellence. This Cambridge, Massachusetts-based university has more than 18.9 million volumes in its library system, which includes more than 80 individual facilities. The historic Widener Library in Harvard Yard serves as the library system's principal headquarters, with other noteworthy facilities including the humanities and social science-focused Lamont Library, the Cabot Science Library, and the Houghton Library, which hosts one of the world's most impressive collections of rare manuscripts and books. In 2012, Harvard introduced a new operational approach to its library system. Designed to improve collaborative efforts across dozens of branches and collections, the new approach unified the formerly separate access, technica, and preservation services functions. Students have reported significantly improved service and functionality since the switch. Another famed member of the exclusive Ivy League, Yale University has served as a center of intellectual and academic inquiry since 1701. This New Haven, Connecticut-based institute is the alma mater of five U.S. presidents and 78 MacArthur Fellows. The extensive Yale University library system includes more than 15 million volumes spread across more than 50 individual facilities and branches. To help users navigate this dizzying collection of academic resources, every Yale undergraduate is assigned his or her own designated librarian as part of the school's personal librarian program. Students can turn to their librarian for research assistance and help finding specific library holdings. In addition, Yale's library system also has subject specialists for 117 different areas of academic inquiry. Thus, the school boasts not only one of the largest college libraries in the U.S. but also one of its best-organized and most accessible. Founded in 1867, the University of Illinois at Urbana-Champaign consistently ranks as one of the top public colleges in the U.S. The school has produced 28 Pulitzer Prize winners and has a reputation for innovation and academic excellence, which is fueled by its outstanding library system that contains more than 14 million volumes. Its landmark Main Library is a focal point of the college's campus; the building was added to the National Register of Historic Places in 2000. The Main Library holds approximately five million volumes in its stacks, making it one of the largest browsable research facilities in the world. The Grainger Engineering Library is another noteworthy institution in the school's academic resource system. With over 300,000 volumes, this library holds the most comprehensive public collection of engineering materials in America. Chartered by England's King George II two decades before the American Revolution, Columbia University represents one of America's oldest and most esteemed colleges. Famous alumni include President Barack Obama and billionaire investor Warren Buffett. More than 350 permanent staff members attend to Columbia University's impressive library collection of 13 million volumes. Individuals can search for items through immediate, combined queries of the system's catalog, periodicals database, academic commons, and geospatial data sets. Students can access research resources in more than 450 languages, and Columbia's assemblage of primary source materials covers more than 4,000 years of academics. Over four million people visit Columbia's libraries each year. The institution is also noted for maintaining excellent resource-sharing connections with other research universities around the world. The University of California, Berkeley, is one of the world's most prestigious research institutions, with research and development expenditures approaching $800 million per academic year. Although the school may be best known for its many important contributions to the physical sciences, it also excels in the arts, social sciences, humanities, and athletics. Made up of 32 branches and affiliate locations, the UC Berkeley library system features the iconic Doe Memorial Library, which was completed in 1911. This neoclassical building deliberately invokes the spirit of ancient Greece -- UC Berkeley's original campus plan envisioned the institute as the "Athens of the West." In addition to 600,000 rare volumes, the school's Bancroft Library also holds one of the world's largest manuscript collections, with 60 million individual documents in its catalog. In total, the UC Berkeley library system holds over 11.5 million volumes, covering virtually all academic subjects. The home of Wolverine athletics, the University of Michigan also enjoys high-ranking status among America's public research universities. Established in 1817, the school is Michigan's oldest institute of higher learning. Approximately 10.8 million volumes comprise U-M's extensive library collection, which includes over 20 branches and affiliate sites housed across 12 buildings in the U-M system. The Special Collections Library, the Shapiro Undergraduate Library, and the Hatcher Graduate Library each represent noteworthy members of U-M's library system. Additionally, the school's Taubman Health Sciences Library contains one of the country's best and most complete accumulations of medical research resources. In addition to an incredible collection of print volumes, U-M's library system also maintains a comprehensive catalog of digital materials. As of 2018, the school hosted over 8.7 million additional digital resources in its institutional repository. Despite its relatively small size, the University of Chicago has proven to be an intellectual and academic heavyweight; its scholars and faculty members have pioneered influential innovations in subject areas like sociology, literary criticism, and behavioralist schools of political science. UChicago's flagship academic research facility is the Joseph Regenstein Library, affectionately known to students and faculty as "the Reg." This building is widely considered to be one of America's most iconic examples of brutalism, an architectural style that came into vogue after the decline of modernism; brutalism emphasizes modular components and functionality while minimizing purely aesthetic elements of design. This approach optimizes the amount of usable interior space, a feature that helps the Reg maintain one of the world's largest single-site book repositories. The American Library Association reports that the University of Chicago library system contains more than 11.6 million volumes. The University of California, Los Angeles, is one of the nation's leading public colleges, boasting a long list of distinguished alumni and affiliated academics that includes two dozen Nobel Prize laureates. Founded in 1919, the school is the second-oldest institution in the University of California system and houses one of the best libraries in the country. UCLA's library system includes 12 official branches in addition to 11 archive centers, research facilities, and reading rooms. About 3.5 million people visit UCLA-affiliated libraries each year where they can browse an expansive permanent collection of 12 million print and digital volumes. The iconic Powell Library is one of the most recognizable buildings on campus. Named in honor of influential university librarian Lawrence Clark Powell, this structure was built in 1929. Sometimes called "Club Powell," due to its atypically lively atmosphere, the library is a center of student life. Staff members offer campus denizens free fruit and coffee during finals week to help ease the stress of examinations. A leading member of the so-called "Public Ivy" group of top public American colleges, the University of Texas at Austin has one of the nation's largest single-campus enrollments. Over 51,000 students and 3,000 faculty members belong to the UT Austin community, which includes a total of 18 separate colleges and academic departments. With a library system that contains over 10 million print volumes, students at UT Austin enjoy access to one of the country's top collections of academic research materials. The UT Austin system includes 13 specialized branch facilities, led by the open stacks of the six-level Perry-Castaneda Library. Additionally, the school's Classics Library boasts one of the most complete collections of its kind in the world, containing important research resources in fields including ancient Greek and Roman history, Greek and Latin literature, philology, and classical civilization. The Indiana University system is the academic home of more than 110,000 students, most of whom attend IU's Bloomington or Purdue University Indianapolis campuses. The university's library system includes over 20 separate facilities, which house an estimated 9.9 million volumes. These libraries also provide access to 815,000 e-books, 60,000 electronic periodicals, and over 800 different research databases. About half of the IU system's permanent collection is housed at the Herman B. Wells Library on the Bloomington campus. Renamed in 2005 to honor the school's longtime chancellor and president, the 11-story building is the subject of an infamous urban legend, which states that the towering structure is slowly sinking, being weighed down by the sheer number of volumes in its book stacks. Although untrue, this story is still commonly told to incoming students. Consistently ranked as one of the top universities in the world, Stanford University is probably best known for its science and technology programs. The school's library system features more than 9.5 million print volumes and houses one of the best and most complete collections of research material related to the history of science and technology. Stanford's main library branch is the Cecil H. Green Library, which houses nearly half of the system's permanent collection of print volumes. This facility primarily focuses on the social sciences and humanities. Other major on-campus research facilities include the 24-hour Lathrop Library and the Hoover Institution Library and Archives. In total, the Stanford library system includes over 20 separate facilities. Beyond the institution's core collection of print volumes, Stanford's libraries also offer more than six million microfilm materials and over a quarter of a million rare volumes and special manuscripts. Based in Seattle, the University of Washington enjoys a strong reputation with regard to its engineering and computer science programs. The school has long maintained close links to several of the world's leading technology corporations, including Microsoft, which is headquartered nearby. The UW library system houses the largest collection of academic resources in the Pacific Northwest; its current collection consists of more than nine million books in addition to millions of journals and microform materials. The system also boasts several special collections, including government publications from the United States, Canada, the European Union, the United Nations, and Washington state. Users can also browse and access thousands of rare books, historical maps, and recorded media. The UW system also maintains numerous specialized branches, with excellent collections of subject-specific materials in fields including architecture, children's literature, 19th-century American literature, photography, and the history of the Pacific Northwest. Founded in 1865, Cornell University has become a leading center of learning in all fields of academic inquiry, ascending to join the exclusive Ivy League. Based in Ithaca, New York, Cornell University utilizes a unique organizational structure, with each of its seven undergrad colleges and seven graduate school divisions maintaining a great deal of independence and autonomy. The rich and varied collections contained in Cornell's library system include more than eight million print volumes, supplemented by an assemblage of digital media and electronic periodical resources. Cornell also boasts high-quality collections in several subject-specific areas, including Old Norse and Icelandic primary source materials, Southeast Asian studies, viticulture, industrial studies, classical studies, and various European language and literature studies. With primary campus locations in Minnesota's twin cities of Minneapolis and St. Paul, the University of Minnesota ranks as one of the leading public research institutions in the U.S. Additionally, its award-winning library system has earned significant accolades in recent years, including the 2009 Excellence in Academic Libraries award from the Association of College and Research Libraries (an affiliate of the American Library Association). Additionally, in 2017, it earned the National Medal for Museum and Library Service -- a prestigious annual prize awarded by the Institute for Museum and Library Services. The University of Minnesota currently ranks first in the country in terms of the number of interlibrary loans it provides to other research institutions. This is largely thanks to its expansive permanent collection, which includes over 7.5 million print volumes. More than 1.8 million visitors access the library system each year. The University of Wisconsin-Madison is as old as the state itself, having been founded in 1848 when Wisconsin officially joined the Union. Today, UW-Madison is a Wisconsin institution, playing a major role in the cultural life of the state's capital city. Students can access a wealth of research and academic resources through the extensive UW-Madison library system. Serving more than four million physical visitors each year, UW-Madison libraries house about 7.3 million print volumes as well as more than seven million items in other formats, including government documents, manuscripts, historical maps, and sheet music. UW-Madison's main branch is the Memorial Library, which is also the largest library in the state. The school extends its research reach by participating in several library resource alliances, including the Big Ten Academic Alliance and the Council of University of Wisconsin Libraries. With a storied history dating back to 1746, Princeton University is one of nine institutes of higher learning founded during America's pre-independence colonial era. This institution ranks as one of the country's leading centers of academic excellence, boasting alumni who include 63 Nobel Prize winners and two former U.S. presidents. Headed by the castle-like Firestone Library, Princeton's library system houses one of the most extensive and complete open book stacks. In total, the school contains more than 7.2 million print volumes spread among 26 distinct facilities, including dozens of specialized library branches, archives, reading rooms, and special collections. Princeton also hosts special exhibitions in its libraries over the course of the academic year, with past exhibits covering topics like European exploration of North America, comic book art, and the private papers of renowned American author Toni Morrison. One of America's oldest public universities, the University of North Carolina at Chapel Hill is the largest and most prominent of the 17 schools in the UNC system. With over seven million print items in its permanent collection, UNC Chapel Hill boasts one of the largest and most complete library systems in the U.S. The school's North Carolina Collection is particularly comprehensive, representing the nation's single-largest assemblage of informational and research resources about any single state. Named in honor of prominent local philanthropist Walter Royal Davis, UNC Chapel Hill's Davis Library serves as the main library branch and has been a fixture of scholastic life at the school since 1984. The school's special collections library -- the Louis Round Wilson Library -- is another noteworthy facility and is widely considered one of the most striking buildings on campus. The Philadelphia-based University of Pennsylvania was founded by Benjamin Franklin in 1740. Following Franklin's spirit of intellectual inquiry, Penn was one of the first academic institutions in the world to adopt a multidisciplinary structure. The university also boasts North America's oldest schools of medicine (the Perelman School of Medicine) and business (the Wharton School). Penn's library system traces its history back to 1750, and Benjamin Franklin himself donated a number of volumes that remain as part of the school's permanent collection. The university's library system includes 20 different branches, special collections, archives, and student service centers. In total, the system includes approximately 6.2 million print volumes in addition to 4.2 million microform holdings, 1.1 million e-books, and over 68,000 periodical subscriptions. Known as one of the wealthiest private schools in the U.S., a 2011 study by Forbes magazine ranked Duke University 11th in the world in terms of the number of alumni who went on to become billionaires. The school's academic excellence is rivaled by its outstanding athletics programs, especially in basketball; the men's team boasts five Division I national titles and the women's team has made four Final Four appearances. At last count, Duke University's library system held more than 7.2 million print volumes, as well as more than 57,000 linear feet of manuscripts. Duke libraries also serve as active instructional centers, with hundreds of education sessions attracting tens of thousands of participants each year. Duke's on-campus art museum -- the Nasher Museum of Art -- also acts as an affiliate of its library system. The museum opened in 2005 and maintains a collection of more than 13,000 pieces. Home of the Buckeyes, Ohio State University hosts one of the most diverse and varied extracurricular student life programs in the United States, boasting more than 1,000 different student organizations. With nearly 60,000 students enrolled at its main campus in the state capital of Columbus, OSU ranks among the largest public universities in the nation. OSU's library system is anchored by the William Oxley Thompson Memorial Library, which was built in 1912. This impressive building contains over 1.2 million print volumes in its stacks. It is the largest member of the school's library system, which is comprised of 19 main-campus libraries and special collections, as well as six regional branches at other OSU locations. In total, OSU's library system contains almost 6.2 million print volumes. A simple methodology was used to compile this ranking. 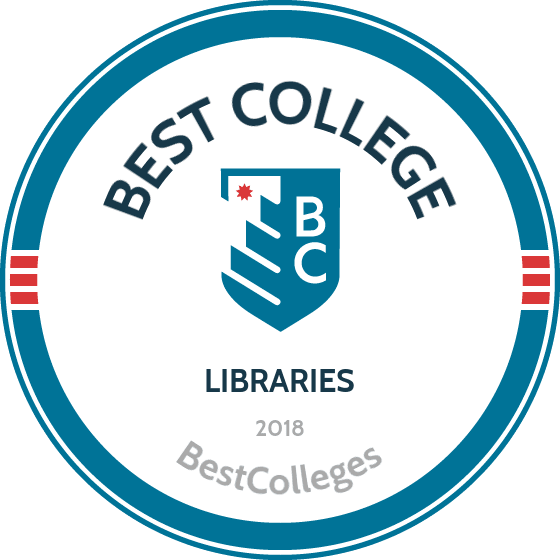 The list below ranks college libraries in descending order based on the sheer number of volumes contained within an institution's permanent collection. While size is not the only indicator of quality in a library, it is generally considered the most important metric when evaluating the utility of a particular facility. The more volumes that can be found at a given library, the more likely it is that students can locate the resources they need, without being forced to fill out an interlibrary loan request. Larger on-campus collections also tend to include a greater density of specialized materials, facilitating precise and thorough inquiry into focused research areas.